In February, the LIGO Scientific Collaboration announced it had detected gravitational waves for the first time, confirming the last prediction of Albert Einstein’s theory of relativity. Somewhat overlooked in the excitement that followed is the fact that scientists don’t know the exact location the waves were coming from. University of Notre Dame astronomer Peter Garnavich is leading a group of researchers who are hoping to more precisely locate where future gravitational waves originate. Garnavich and the group are using the LBT (Large Binocular Telescope) in southeastern Arizona to search for visible light emission from the event generating the gravitational waves. 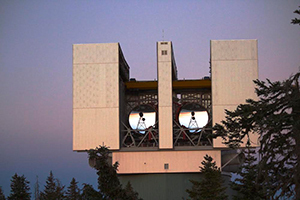 Notre Dame owns a share of the LBT project, which consists of two 8.4-meter mirrors and is the world’s largest telescope on a single mounting. The team is searching the sky to find the light emitted from supernovae and gamma ray bursts, and now gravitational wave transients. Garnavich notes that the gravitational waves that the LIGO group detected emanating from two black holes merging were somewhat of a surprise. Garnavich notes that the effort to more precisely locate gravitational waves is akin to searching for a needle in a haystack. The swath of space that LIGO’s research identified as a possible location of the event can contain millions of stars and galaxies. Garnavich’s group is hoping to use the LBT and other observational surveys to identify promising candidates and eliminate not-so-promising ones. “I hope this LIGO event was the first of many so we can combine gravitational waves and electromagnetic waves to figure out what are creating these exotic events,” he said. Given past experience, a breakthrough like the LIGO discovery opens the door to even more discoveries. The search Garnavich and his group is undertaking has the potential to provide a new understanding of how the universe works. Originally published by William G. Gilroy at news.nd.edu on March 29, 2016.